Native to South America, rosehip oil is made by cold-pressing the seeds of the fruit of the rose plant (the little red bulbs that appears after the flowers fall off). It is rich in essential fatty acids, vitamins, and minerals, and natural anti-oxidant properties that help improve the elasticity of the skin, regenerate skin cells, slow down premature aging, and reduce the formation of wrinkles and scarring. Rosehip oil is extremely high in Vitamin C, in the form of essential fatty acids, which retain and attract moisture for healthier skin. Vitamin C is also necessary for the production of collagen, one of the main proteins in the skin. It is great for mature or damaged skin and can be used to fade blemishes such as pigmentation spots, acne scars, stretch marks and sun-damage. Just a few drops go a looong way, especially on damp skin. Face, neck, decolletage, and tops of hands are the main anti-aging spots you want to hit. But really, use it anywhere. Rough elbows, dry feet … it feels very luxurious on the skin. Rosehip oil helps regenerate tissue, and is excellent for treating burns immediately after they happen. Apply multiple times daily to affected area; heals skin quickly and vastly reduces visibility of scars. The only thing for which it seems to be contraindicated is active acne. It’s good for diminishing the appearance of acne scars, but not for use when acne is active. It is a nongreasy carrier oil which absorbs quickly into the skin without leaving behind shiny residue. It has a light, nutty aroma which can easily be enhanced with a variety of essential oils. The color is a beautiful and surprising deep amber. Ouch! *sob* Keep going. Must. Feed. Children. Breakfast. After the little creatures were held at bay with healthy whole-grain waffles and nitrite-free turkey bacon, I started treating my tic-tac-toe-board-for-a-hand with a few drops of rosehip oil every day. A few weeks later, my hand had NO gridmarks, NO scar, NO sign of damage to the skin whatsoever!!! I sort of feel like a born-again because I’m so convinced of and vocal about the magical properties of this oil. So much so that I even went out and bought a gallon of virgin organic cold-pressed rosehip oil from Chile and separated into 2-oz amber glass bottles with glass dropper in lid to distribute amongst my friends and loved ones. I want the world to enjoy the benefits of this oil, and I still have a good number of bottles left. My favorite thing about rosehip oil: How it evens out my splotchy skin tone, flattens my keloid scars, and plumps up my skin in general. 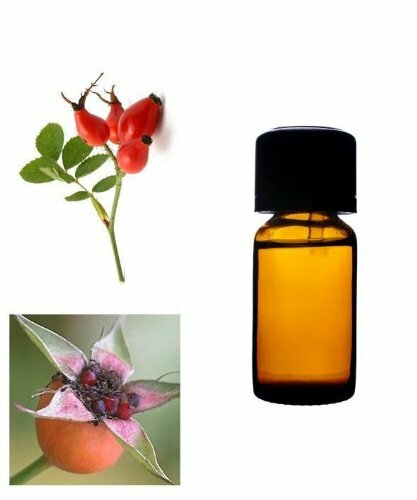 Tell me and our other readers below what you like best about what rosehip oil is doing for your skin. Good things, no doubt! Nooks and crannies. I just love them. I must have been a squirrel or a chipmunk or something in a previous life. I love storing things away in little spaces. I love when everything is tucked away in it’s own special place. Now mind you, my things may not actually stay in their places for very long (or at all, for that matter) but at least I have identified those places where they should be, so I’m halfway there, right? As you can imagine, I have a penchant for food storage containers with sections. Yes, seriously. I love nooks and crannies in my food storage, so the wet things can be separate from the crunchy things and the raw things are far away from the creamy things, and so on and so forth. Of course you can imagine how absolutely tickled I was to receive from Laptop Lunches a sample bento-style lunchbox for review here on my blog. 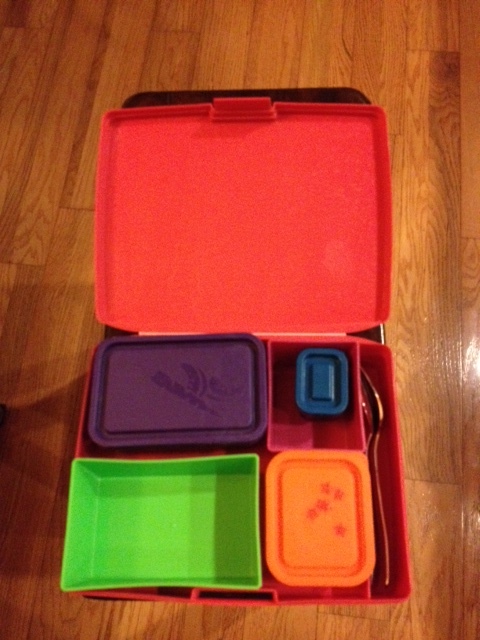 Red on the outside, multicolored on the inside … the lunchbox just shouts “Happy day!” no matter what you put in it! So anyway, the exterior lunchbox and all its individual compartments are made in the good ol’ U S of A. Yes, they’re plastic, but some of that is recycled content. And they’re safer than other plastics, with no lead, phthalates, BPA, or PVC (vinyl). They can take a beating (one of mine flew off the car roof and a good portion of it survived! ), and the colors are just plain fun. There are five interior containers that hold everything from sandwiches to fruit salad to dips, whatever your imagination and knife skills can fit in there. One day, I used cookie cutters to shape bread for toast pieces which I served with egg salad. Another day, I cut celery the short way to make “celery bridges” (waaaaay less stringy, according to Ecogirl), served with Caesar dressing for dipping. One day Ecogirl implored, “Mom, I want Dora yogurt” which she’s never had in her life but sees at the grocery store and at the homes of some of her friends. I was unwilling to buy it, but sympathetic to a three year old’s desire for the latest and greatest character-branded merchandise. So what did we do? 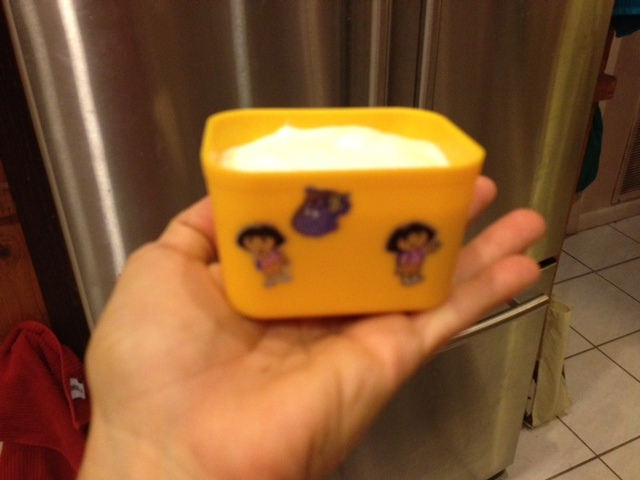 We decorated one of our small interior bento containers with our own Dora stickers, and now she has Dora yogurt any time she wants (our version made with organic plain yogurt and local raw honey). If the mood strikes one day, then we are more than ready to change it out for a Disney princess yogurt container, or a celestial container covered with star stickers … one’s imagination is only limited to one’s access to good stickers. Yoplait ain’t got nothing on us! All compartments and lids are dishwasher safe, including the exterior lunchbox itself. I love that the compartments are all separate, so if there’s only a bit of one food leftover from lunch, you can just take out that one container and put in the fridge. If you’re not sold yet, why don’t you check out this great link featuring 365 lunch ideas for fall, with beautiful, colorful images? Now that I’ve got you excited to ride the bento bandwagon, let’s talk GIVEAWAY! Laptop Lunches has generously furnished a $25 gift certificate to give to one lucky Ecomama Says reader. That will get you one super-duper, handy-dandy bento lunchbox, or some other fun items like an insulated soup container or a decorative lunchbag. One lucky winner will be selected by the end of the day on September 3, 2012, Labor Day, just in time to go back to school! So, tell us, dear readers: What would you buy with $25 from Laptop Lunches? Update: We have a winner! Monica D., have fun shopping through all the fun colors! Thanks to all for participating, and thanks again to Laptop Lunches for furnishing this great giveaway! Black gold, that is. And I’m not talking about crude oil. Composting is a great way to reduce your landfill-bound trash, and turn something you don’t want (rotting kitchen scraps) into something you do want (nutrient-rich soil). To insure success, there are a few rules of thumb you need to follow. Unless you want to host a maggot party in your compost bin, you cannot put any animal products into your compost. Maggots aren’t the worst thing ever, because they’re just helping decompose your scraps in their own disgusting way. But a compost pile is much nicer without them. So, no meat, poultry, fish, dairy, or eggs. Exceptions are eggshells and shrimp tails. Eggshells do take a long time to decompose, so I let my cracked eggshells dry, put them in a ziploc bag (which I reuse each time til it has holes in it) and punch and roll the bag til the whole shells are pulverized into tiny pieces. Great way to get out some aggression; bang bang, smash! Coffee grounds are really good for compost. You could even take the grounds and put them directly on your plants, but you have to let them cool first. I find it easier to just dump the grounds into the compost bin and let them mix with everything else. It’s a good idea to keep a container on or under your counter in which to collect kitchen scraps. If you’re anything like me, you probably won’t make it outside to your big compost bin every day, so you want something with a lid that will trap odors. Keep in mind: the smaller you chop your scraps before tossing them in, the quicker they’ll decompose. Banana peels are easy enough to rip into pieces with your hands, as are avocado skins. Something larger and thicker like watermelon rinds or half grapefruit peels should definitely be cut with a knife. If you don’t cut, it will decompose eventually, but “eventually” is the key word here. It will take a lot longer. For optimal conditions in your compost, you want to have a balance of wet matter (kitchen scraps) and dry matter (shredded paper). Different experts have different opinions on the exact ratio, anywhere from 1:1 to 1:4. I generally end up with somewhere between 1:1 to 1:2. Your compost bin should be about as damp as a wrung-out sponge, but no wetter than that, otherwise it’ll just be a smelly pile of muck. You will have to experiment with your own ratio of wet matter to dry matter to get the perfect consistency. The wet matter is easy to provide: kitchen scraps! If you eat your fruits and veggies like you should, you will have plenty of those. For dry matter, I take every piece of paper towel, paper napkin (slowly phasing these out), or tissue we use in the house, rip into small pieces, and add to the compost. I also take some of my mail or printer paper that didn’t print quite right, put it through the shredder, and add that too. Some people use leaves or dried out grass clippings as their dry matter, but I find that leaves in particular take forever to decompose. Our lawn mower mulches the leaves as it runs over them, so they go back into the soil right then and there. So now you’ve got your container under or on the counter. Into what big container are you going to transfer its contents? You could just have a big pile of scraps and paper and yard clippings in the corner of your yard. When I lived in Vermont, I had friends who did it this way. However, then you have to worry about animals and pests getting in, and you have to turn it with a pitchfork. Headache. And backache. 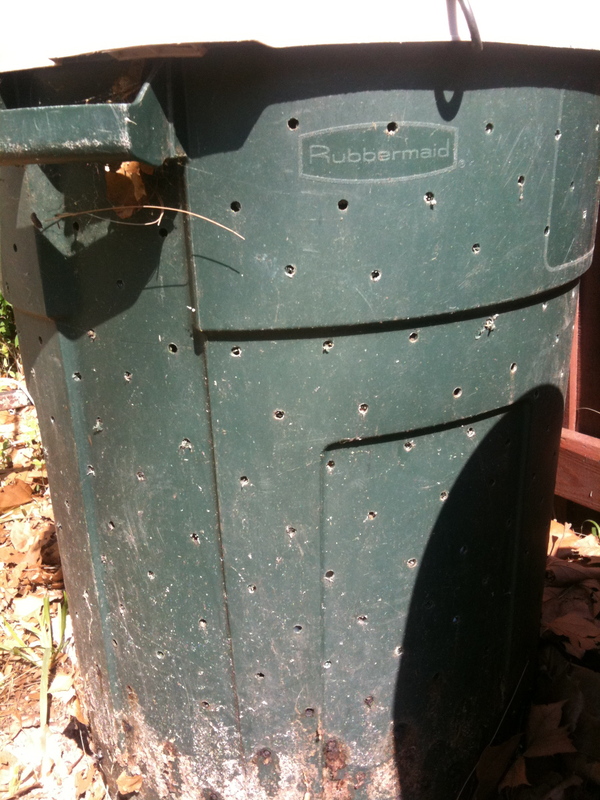 You could go to your local hardware store and buy a hundred dollar compost turner, resolving the pest and turning issues. I used to have one, back when I had no kids and more disposable income. Ah, those were the days. Now, I have a round 33 gallon garbage can with a lid, a couple of bungee cords across the top, and holes drilled throughout. Voila! 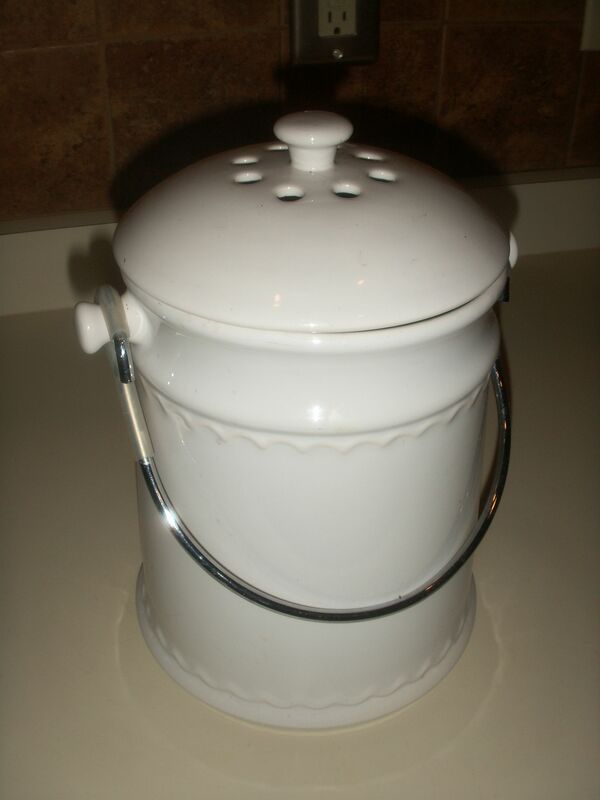 You’ll want to drill holes in the lid and all around the sides several inches apart. This will allow for good oxygen flow. 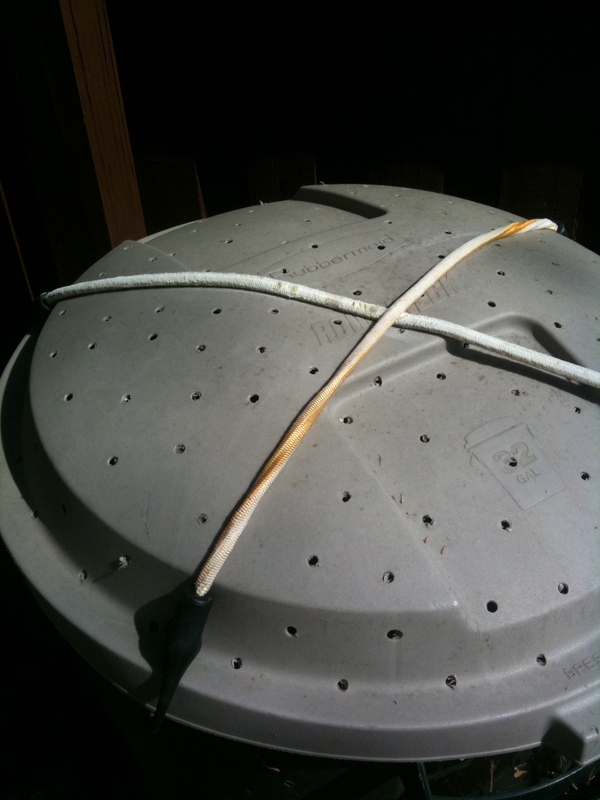 Also, the holes in the lid will let in some rain while the holes on the side will let out excess moisture. Don’t drill holes in the bottom four inches of the can. This will help keep in enough moisture so that your compost doesn’t get too dry. If you find it’s getting dry, just add a little water with a hose or watering can. But not too much. Remember: it should be damp like a wrung-out sponge. To get the most rapid result, you need to aerate, or turn your compost. The aerobic organisms that break down your compost need oxygen to survive. Take your handy dandy homemade garbage can compost bin and kick it down on its side. The bungee cords keep the lid from falling off). Roll the can back and forth with your foot, and pick it back up again. Easy peasy. When my first can got to be about 2/3 full I stopped adding to it, so that it could decompose all the way down to compost without new scraps being added. I bought a second can and bungee cords, drilled holes, and started adding scraps and paper to that one while the first one “cooked”. I still turned the first one to aerate, and checked the moisture level. Soon I had my first batch of compost! I added it to my container vegetable garden and looked forward to my plants flourishing. Then I had Ecobaby. The plants got demoted and pretty much forgotten as I watched the weeds flourish instead. When both kids are a little bigger, and Ecogirl can really help me in the garden, I fully intend to grow vegetables and herbs anew and put my rich, loamy compost to good use. In the meantime, I can boast that my dandelions are two feet tall. Ever notice how sometimes the lettuce at the store looks pretty good, and other times, it’s seems more anemic than usual? It’s smaller because, as the days go by that it sits there unsold, the wilting outer leaves are picked off to keep it looking fresh. Meanwhile, the brand new lettuce that was just delivered is hidden away in the back until the wilty stuff is all sold. It’s a crying shame. I get my organic produce every two weeks from a co-op (short for “cooperative”) run by a friend out of her home. It’s a great lesson for her three home-schooled daughters. My friend makes no profit on this endeavor; she just needs orders from other people to fill cases so she can get cheaper organic food for her family. Companies will lower their prices if they know they’re going to sell a large quantity of their products. They require a minimum order, either a minimum quantity or a minimum dollar amount. For my organic produce co-op, it’s a case minimum: orders have to be placed by the case. Here’s an example: a case of broccoli is 14 bunches. Obviously, one family won’t buy all 14 bunches of broccoli. But eight or ten families might. So if you buy one, I buy two, he buys two, she buys one, and so on and so forth, we hit the case minimum, and we get the product at the wholesale price. I’m getting my produce super fresh and super cheap. Score! I run a buying club for a natural products catalog that has everything from herbs and spices to body products to kitchen accessories to pet treats and much more. They don’t require a minimum order to get wholesale pricing, but I do need to hit a minimum of $250 to get free shipping. I set up a Google group so I could communicate with member of my buying club. Every month, I post the monthly sales catalog to the group and members email me their orders. I compile them all and when I hit the $250 mark, I place the order. When everything comes in, I separate the orders, and everyone comes to my house to pick up their stuff. One of the members lets me use her credit card for the orders. Everyone writes their check to her, and she gets airline miles out of it. Talk about cooperation! It’s a win win. If you are not aware of co-ops in your area, try to start one. Contact a company from which you are interested in buying, and ask them if you can set up a wholesale account. Some will require a business ID, but others will allow regular consumers like you and me to just meet their minimum order requirements, either ordering cases or ordering a certain dollar amount. It’s up to you to find members for your co-op to help you meet the purchasing minimums, but it doesn’t take long. Start with a handful of people, and let word of mouth be your advertising. This helps insure your safety too, especially if people will be picking up at your house. Everyone in the co-op is a friend of a friend. It won’t take long before you’ll have enough people to insure lower pricing and fresher products for everyone. Just cooperate and make it happen! Reduce, reuse, recycle. This slogan reflects the trifecta of the green movement. Use less. What you do have, use again. What you can’t use anymore, recycle. Ziplock bags get washed, turned inside out, and dried to be used again until they have holes in them. I’d love to hear your ideas for creative re-uses of household products.